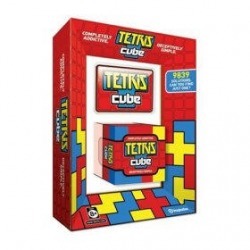 The Tetris Cube is very similar to the Bedlam Cube in the way in which it goes together, although the number of solutions is only 9839 compared to 19186 on the Bedlam. I think it is still a very difficult puzzle and i have spent many hours on it. Now for some really mind blowing stuff, this guy has created software which calculates all 9839 solutions along with a mathematical explanations!